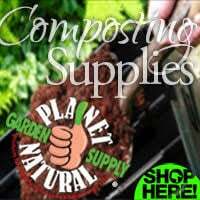 All you need to know about making compost is a basic understanding of a few simple principles, and a little bit of elbow grease. Nature does the rest. Composting, the practice of making organically rich soil amendments from yard, kitchen and other wastes, requires a number of conditions but is dependent on one thing: the microbes responsible for decomposition. These single-cell organisms, working through strength in numbers, turn your compostable materials into the rich humus that’s the foundation of all great growing soils. Supply these microscopic creatures with favorable materials and conditions and they’ll reward you and your gardens with healthy, productive plants. We’ll talk about all the things that composting requires — oxygen, moisture, heat, the makeup and balance of compostable materials, not to mention practical requirements — locations, containers and the work involved (as little or as much as you like)– but first, some background on the microbes who facilitate the composting processes. There are two general classes of composting microbes, the aerobes that work when oxygen (from air) is present, and the anaerobes, which work when it’s not. The kind of microbes you’ll be encouraging depends on the kind of composting you’ll do–ventilated, aerobic composting (the most common; piles, heaps and tumblers) or sealed-container anaerobic composting. When we think composting, we’re almost always thinking of the heaps, bins, ventilated barrels, and other types of aerobic composting. The naturally occurring aerobic microorganisms that populate them require air and its oxygen to live. These microorganisms “eat” their way through the pile’s organic matter, the mix of yard, kitchen, and other green waste that makes up compost. As they consume this organic matter, they change it chemically, molecule by molecule. The digestion process, as the equation shows, give off energy (heat), water, and carbon-dioxide in the process. Where do the aerobes come from? 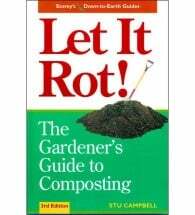 The classic Bible of composting, Let it Rot! points out that composting microorganisms are already everywhere in soil, so it’s not really necessary to add them to a pile. Since its first edition in 1975, Let it Rot! 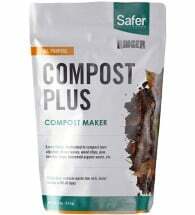 has helped countless gardeners recycle household garbage, grass clippings and other waste materials into useful, soil-nourishing compost. It’s the classic guide to turning household waste into garden gold! It’s true that most piles will take up aerobes from soil and surrounding environment and, provided the proper temperatures and moisture levels plus an occasional turning to replace consumed oxygen, and will eventually produce modest result. But inoculating a pile either with a compost activator available through organic gardening stores or finished compost already rich in micro-organisms from a neighbor or commercial source, can get it off to a quick and hot start. Sprinkling your chosen material between layers as they accumulate, a variation of the classic “lasagna-style” of composting (PDF), rather than pouring it on top of a finished pile ensures a better distribution of inoculants, and a correspondingly quick start to the composting process. 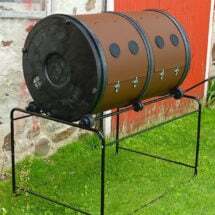 Any sealed composting system depends on anaerobic micro-organisms. If you fill a plastic bag with table scraps and yard waste and set it in the sun, it’s anaerobic micro-organisms that will break down that material. The result will be a soupy, foul-smelling mess higher in acids than solid compost, but perfectly useable as a soil amendment. Anaerobes require organic material and water to do their work, giving off carbon dioxide, methane, hydrogen sulfide, and energy. Methane is of course a potent greenhouse gas, while hydrogen sulfide provides an equally potent smell of rotten eggs to an anaerobic pile. Large scale, municipal and commercial compost operations of the kind that process restaurant and other food waste have found ways to utilize the gases released by this kind of composting. In a compost heap, however, large populations of anaerobic microorganisms, resulting from a lack of oxygen, usually spell trouble. The anaerobic process is slower than the aerobic, and can produce the kind of smelly pile that doesn’t foster good neighbor relations. The Bokashi System is an anaerobic, self-contained method of composting table and other kitchen scraps that is odorless and can fit neatly under a kitchen sink or other indoor places. Aside from its Bokashi page, this site concentrates on aerobic composting. The needs of your microbes — food, water, warmth, oxygen — are all key ingredients. The “food” means sources of carbon– brown materials including dead leaves, pine needles, and sawdust — and nitrogen sources–green waste including kitchen scraps, fresh cut grass, and additives such as blood or bone meal– in a ratio of 25 parts brown materials to 1 part green. See “What To Use” for a detailed discussion of what to feed your pile for best results. The microbes that do the dirty work in the compost pile require water for survival, but it can be hard to judge how much water to add and when. Too much water can smother the pile, which means your organic waste won’t decompose and you’ll get a slimy and smelly pile that could well answer to the name “swamp thing.” Too little water and you’ll kill the bacteria and you won’t get your compost (see Managing Moisture in Compost). One rule of thumb: the more green material (cut grass, weeds, leaves) you put in, the less water you’ll need to add. In fact, if you need to add dry ingredients such as straw or hay, soak the material first in water so it won’t dry out your compost pile. In general your compost should be moist, but not sopping wet. If you are composting at home and you get a lot of rain, build a roof over the pile. This can be as simple as stringing a tarp. The reason you want to give your compost pile more shelter is because nutrients, or leachates, leak out when it rains. That’s not such a problem in a place where rainfall isn’t heavy, but if you get a lot of rain where you live, it can make a big difference. Too much water in the pile will slow down the process and can also make it slimy and icky. Best you add the moisture to your pile, rather than unpredictable Mother Nature. For nearly forty years, the Original ComposTumbler has made it easy to turn the pile. Makes a complete batch, from start to finish, in just 14 days. 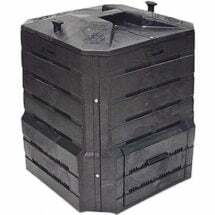 Big enough for serious gardeners (holds 168 gallons, 22 cubic feet), easy enough for anyone! Oxygen is also required by the aerobic microorganisms responsible for successful composting. Give your pile adequate ventilation and they will take care of the rest (see Aerobic Decomposition). You can make sure that the bacteria in your compost gets sufficient air by turning the pile often and well. Use a pitch fork, spade or compost aerator to mix your pile. 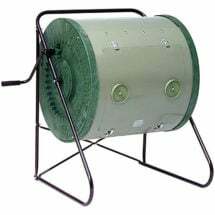 If you’ve got a compost tumbler, you’ve got it easy. Just crank that lever. It’s also a good idea to turn the contents since it rearranges the decaying material. With a little care, you can move the less decomposed material on the edges to the middle of the pile to heat up. Don’t aerate your compost at all and it will break down slowly, possibly resulting in a slimy, dense, stinky pile. More information on microbes and composting is here, compliments of the University of Illinois Extension Service. First you’ll want to select the most suitable location for composting. Your choice of where you make your compost should consider both function and aesthetics. 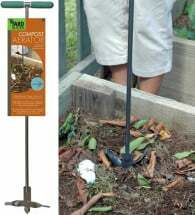 Standard compost piles, contained in standing frames or not, are best tucked away by the garden, convenient for filling and using. 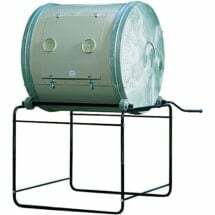 Compost tumblers and other tidy, self-contained bins can be placed right by the back door convenient to kitchen scraps or near the plots where they’ll be emptied. Not even the crankiest neighbor who believes the myth of the smelly, pest attracting compost heap, considers them an eyesore. But, in consideration of appearances and good relations with your neighbors, not to mention your postal carrier, it’s probably not a good idea to place your compost bin, say, on the front lawn next to the mailbox. A behind-the-scenes location can go a long way to preserving good community relations. Some few towns and many homeowner associations have regulations and covenants. Know what might apply. Manufactured in Sweden, the Green Johanna Composter works more quickly than standard units and can be used to break down all types of kitchen waste including cooked food, bones, fish and meat. This patented “closed” unit provides good ventilation and is easy to empty yet does not allow pests to access the contents. 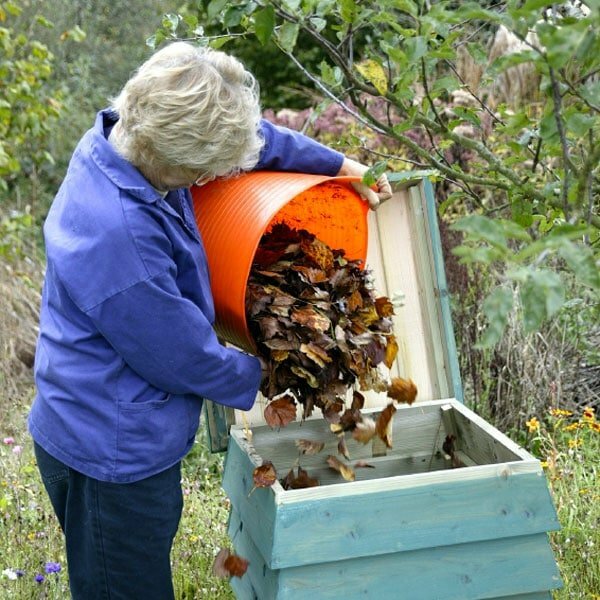 Want to build your own compost bin? Here’s one simple solution: convert old shipping pallets (which you can usually pick up for free) into a compost “repository.” Use one for the bottom, placed with the slats running in the same direction as a garden fork will go when emptying it out. Pound in metal support poles and then add pallets by slipping them over the support poles to make your bin’s walls and you’re all set. 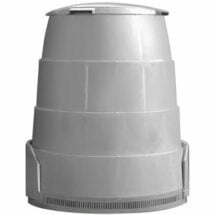 The University of Missouri Extension offers several other examples for building a bin. You can also skip the bin (a structure isn’t essential) and just have a compost pile or heap. In terms of appearances — and if your homeowners association is fussy — you may want to screen the pile from view by planting shrubs or a fence. You’ll also probably not want it by your picnic table or other areas outdoors where you entertain. Choose a spot with good air circulation. Don’t place it next to your home or other wooden buildings as the decomposition process may cause damage. Partial shade is a good idea so the compost doesn’t get overheated. Also make sure the spot of land where you place your heap gets good drainage. Close to the garden and to a water source are both good places for building a compost pile since it will be easier to move the materials to and from the garden and easier to water it. Another idea may be to place it near your kitchen to make it convenient to place table scraps on the pile or in the bin.